To say that George Miller has stepped up his game since he left us at Thunderdome would be far too mild a statement to open with. Mad Max: Fury Road is not just superior to everything in this franchise, as well as everything else Miller has ever directed. It’s among the most exhausting, thrilling, visceral action films ever made. Powerful, villainous white guys have ruined the planet by way of their greed for oil and their warmongering, and now they are sustaining their power by taking control of women’s reproductive systems. So, you know, pretty far-fetched. But Max doesn’t belong to any of these festering wounds called societies. He’s feral. Again. No telling how long it’s been since Max saved the kids from Aunty Entity, but he’s lost himself again, wandering the desert hunted by man and haunted by those he couldn’t save. Again Miller puts Max in a position to redeem himself by helping the vulnerable and pure survive this apocalyptic future. Mercifully, there are no children and no mullets this go-round. 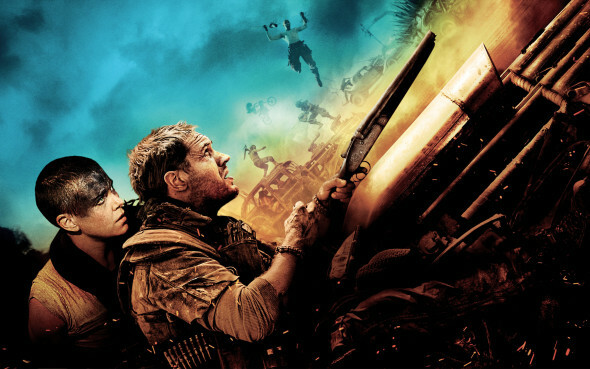 Unsurprisingly, the great Tom Hardy delivers a perfect, guttural performance as the road warrior. As his reluctant partner in survival, Charlize Theron is the perfect mix of compassion and badassedness. Hardy’s a fascinating, mysterious presence, but Theron owns this film. Like the first two films in this series, Fury Road wastes little time on dialogue or plotting. Rather, it is basically one long, magnificent car chase. Miller adorns every scene with the most astonishing, peculiar imagery and the vehicular action is like nothing you’ve ever seen. Miller’s magnificent action sequences keep the film from ever hitting the dragging monotony of his first two efforts in the series. While the characters remain as paper thin as they have been in every episode, the vast superiority of this cast from top to bottom guarantees that the marauding band’s excess and abandon are handled with genuine skill. Fury Road amounts to a film about survival, redemption and the power of the universal blood donor. Clever, spare scripting makes room for indulgent set pieces that astonish and amaze. There’s real craftsmanship involved here – in the practical effects, the pacing, the disturbing imagery, and the performances that hold it all together – that marks not just a creative force at the top of his game, but a high water mark for summer blockbusters. The End is Near! The Quiche is Cold!